The cross country team at the Calvin Knights Invitational. Photo courtesy of Ted Williamson. The University of Michigan-Dearborn men and women’s cross-country teams both traveled to Grand Rapids this weekend to race in the Calvin Knights Invitational. The weather conditions were ideal with cool temperatures and clear skies. The men’s team finished 22 out of the 29 teams that participated. They ran an 8K race. The women did not have a full team for Saturday’s race. Only three women ran a 5K— a minimum of five is required to receive a team score. The top men finishers placed 77, 101, 123, 124, 145, 151, and 158, respectively. 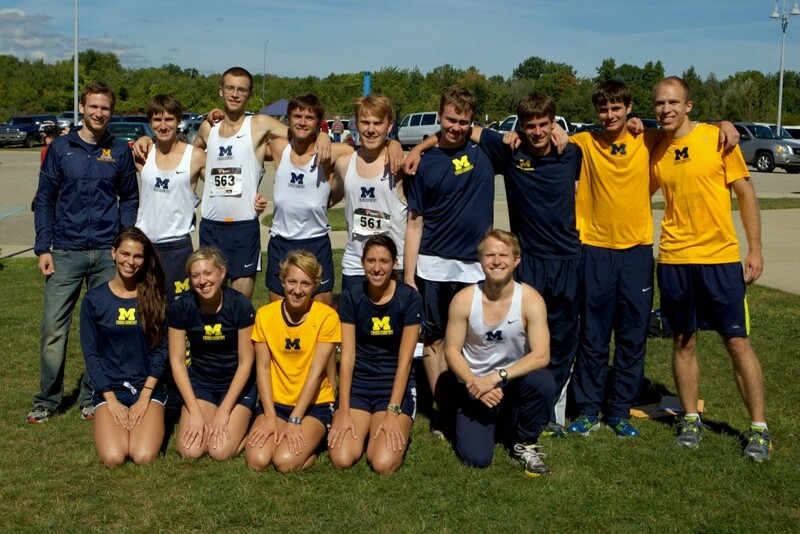 Quinn Osgood was the top finisher among the Wolverines, with a time of 27:07. Following Quinn was Ryan Pickell, with a time of 27:41, and Nick Williamson, with a time of 28:17. Senior Mark Waterbury finished fourth on the team for a career-best time. Overall, 336 competitors participated in the men’s race. As for the girls, only three of the six girls on the team participated in Saturday’s meet. The other three did not participate due to eligibility and family reasons, but are expected to compete in the next meet. There were 336 competitors who competed in the women’s race. Lina Davis was the top finisher for the women and placed 149 overall. Mallory Nemeth placed 231 and Erika Antanovich finished 259. The next meet for both teams is the Greater Louisville Cross Country Classic on October 5 in Louisville, KY.